CAA senior director of business development BC/AB Brian Good presents the 50-year CAA Heritage Award to Doug Munton (r) of Benchmark Angus. You can buy CCIA-approved RFID tags for your Angus-influenced cattle from the Canadian Angus Association. The Canadian Green Angus Tag Program is the largest branded tag program in the world. The tags visually and electronically identify the cattle as containing a minimum 50 per cent Angus genetics. As a Canadian Angus tag user you are eligible for free age verification services through the Canadian Angus Association. You are also eligible for a free membership to the Commercial Angus Identification and Performance Program (CAIPP) which records pedigree and performance information on your commercial Angus-tagged animals. CAIPP uses this information (and DNA parentage testing) to provide you with valuable marketing and genetic selection tools. Benefits to using Canadian Angus RFID tags: The only way to get Red Angus cattle into any Angus-branded beef program in Canada is for them to be tagged with the Canadian Angus tag. There are a number of branded beef programs in Canada that are unable to find enough verified Angus cattle to satisfy their program demands. The only way to verify is with a Canadian Angus tag. We are moving closer to where major Angus-branded programs will need to prove that what they are selling is Angus, and the only way to verify minimum 50 per cent Angus genetics is by procuring cattle that wear the green tag. Angus Hearts, Angus Pride, Certified Angus Beef — Cargill Foods, High River, Alta. Angus Trim Verification — Cargill Canada, Spruce Grove, Alta. JBS Food Canada Inc., Brooks, Alta. St. Helen’s Meat Packers, Toronto, Ont. Meyers Angus Beef — Cargill Foods, Guelph, Ont. Paradise Black Angus, Paradise Premium Black Angus, Paradise Signature Black Angus — Canada Select Meats, Toronto, Ont. Ryding Regency Angus, Ryding Regency Selected Angus — Ryding Regency Meat Packers, Toronto, Ont. St. Helen’s Angus Classic — St. Helen’s Meat Packers, Toronto, Ont. Sysco Butcher’s Block Reserve Angus — Cargill Foods, High River, Alta. Western Royal Angus — Canadian Premium Meats Inc., Lacombe, Alta. 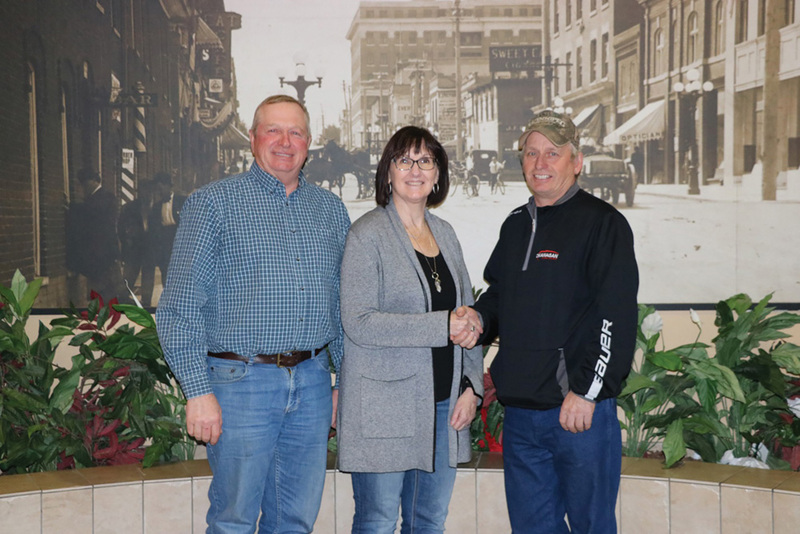 Canadian Western Agribition (CWA) introduced its new leadership team last month in Regina. Bruce Holmquist of Kinistino, Sask., was re-elected as president. He’s volunteered at the CWA for 40 years in several capacities, joining the board of directors in 2007 and the executive in 2012. Holmquist is, of course, the general manager of the Canadian Simmental Association. The other members of the CWA executive are vice-president Chris Lees of Arcola, Sask., and executive members at large: Kim Hextall, Grenfell, Sask. ; Levi Jackson, Sedley, Sask. and Curtis Kuchinka of Regina and past president Stewart Stone, also of Regina. The remaining directors are: Kelsey Ashworth, Oungre, Sask. ; Carla Borsa, Waldheim, Sask. ; Marty Kratochvil, Milden, Sask. ; Ross Macdonald, Lake Alma, Sask. ; Ali Pike, Grand Coulee, Sask. ; Jodi Banks, Regina, Sask. ; Michael Latimer, Calgary, Alta. ; Courtney MacDougall, Regina, Sask. ; Blake MacMillan, Nokomis, Sask. ; and Barry Young, Carievale, Sask. Appointed directors include: Jerry Flegel (City of Regina), Dana Lajoie (Agriculture and Agri-Food Canada), Kim Onrait (City of Regina), and Grant Zalinko (Sask­atchewan Ministry of Agriculture). While Canadian Western Agribition (CWA) posted a profit from operations of $270,411 last fall, its impact on the provincial economy amounted to $73.6 million. It was a milestone year for the organization, starting with the opening of the International Trade Centre (ITC). The CWA contributed $1 million to the project. But it didn’t stop there. A number of records were set at the 2017 show: $2 million in purebred cattle sales; 27,000 attendees at evening events; 365 international buyers from 86 different countries who spent more than ever before; and record operating revenue of $4.6 million. The 2018 show will over more of the same plus a new after-party cabaret in the Brandt Centre on Saturday night after the final Pro Rodeo performance. The Canadian Limousin Association will hold its annual general meeting on August 3 in Great Village, N.S., in conjunction with the Canadian Junior Limousin Association (CJLA) Impact Show. The CJLA Impact Show runs August 1-4 at Balamore Farm Limited in Great Village. It is the first time for this youth in the Maritimes to recognize the growing enthusiasm for the Limousin breed in the region. It is growing rapidly! Impact is open to anyone 21 years and under with a one time $25 CJLA membership fee. Cattle will be available for out-of-province juniors to show. Full details can be found online at the Canadian Limousin Association website. Canadian Junior Hereford Association Bonanza, set for July 17-21 in St. Hyacinthe, Que., is fast approaching. Junior members were being reminded to file their entries for this popular event before the deadline of May 15, 2018. For more information go to the Canadian Hereford Association website. The 11th Annual Manitoba Youth Beef Roundup is set for August 3, 4 and 5 in Neepawa, Man. For more information go to the Manitoba Youth Beef Roundup website or check out the Manitoba Youth Beef Roundup Facebook page. 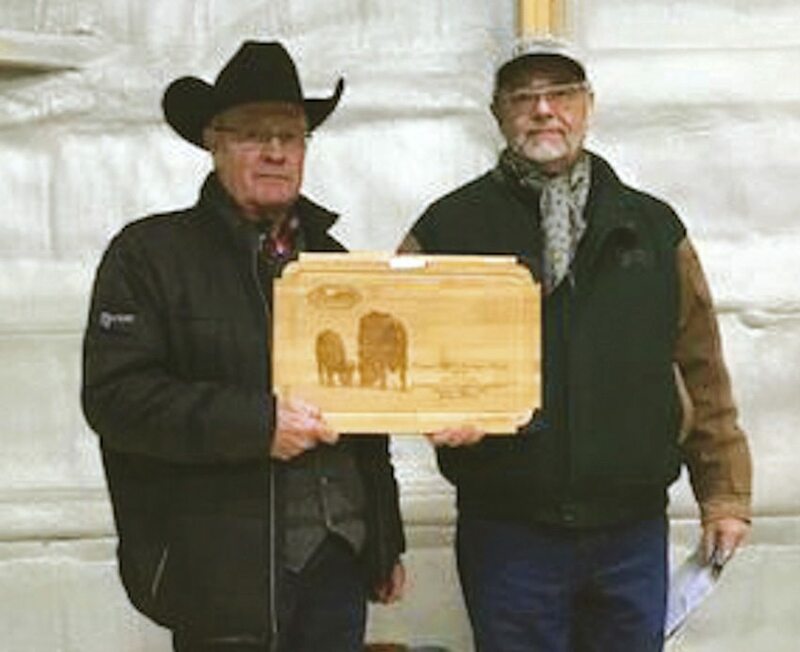 The Canadian Angus Association (CAA) honoured the Munton family of Benchmark Angus at Warner, Alta., for its 50 years of consecutive membership in the association during their 22nd annual bull sale on April 2. CAA senior director of business development in B.C./Alberta, Brian Good presented the award (see photo at top). 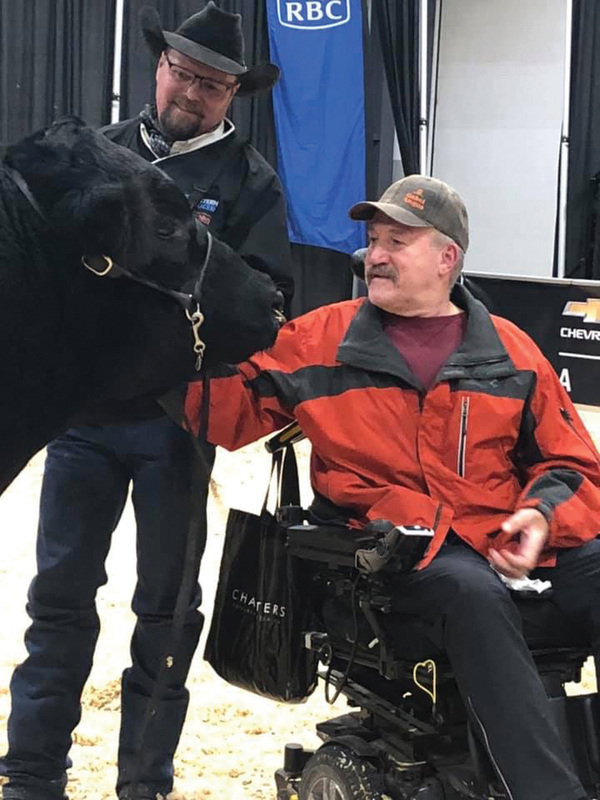 Doug Munton and his father Stanley began raising purebred Angus cattle in 1960, when Doug, who was still in high school, bought his first female from Coalbridge Farms of Coaldale, Alta., and founded Alcan Angus. Baros of Alcan Angus 40’73 was Champion Angus Bull at the Calgary Bull Sale and his genetics are prevalent today in such bulls as Cudlobe Stemwinder, GDAR Oscar 711, all the Crackerjacks and many more. 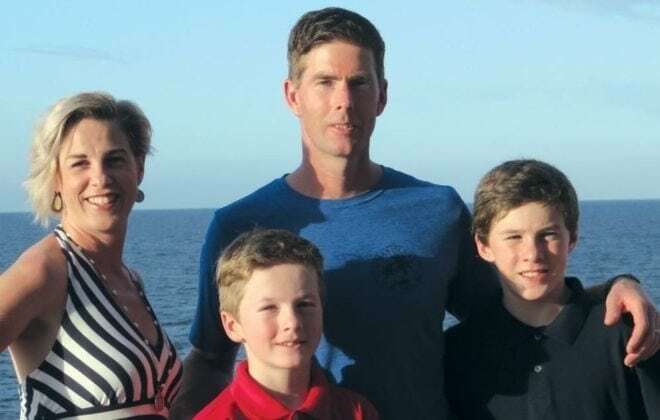 Doug continued to raise and breed Angus while establishing a chartered accounting practice. In 1990, after his son Michael graduated from Oklahoma State University they formed Benchmark Angus and began building their Angus cow herd on leased land. In 2000 they took ownership of the Morton Ranch west of Warner where today Benchmark Angus runs 300 Black Angus cows and 120 Red Angus cows. Very few purebred females are ever sold. The top end heifers each year go back into the cow herd. The Canadian Angus Association instituted a long-term recognition award program in 1998 to honour individuals and families that have demonstrated a long-term commitment to the Angus breed in Canada by maintaining a continuous membership in the association for at least 50 years. In 2011, the award program expanded to recognize families with 75 and 100 continuous years of membership. Rob Matthews was awarded the Don Matthews Memorial Award at the annual meeting of the Canadian Beef Breeds Council on March 28. The Don Matthews Memorial Award was instituted in honour of the late Don Matthews, a past president of CBBC, whose many other accomplishments also include induction into the Canadian Agricultural Hall of Fame. The award is presented annually by the Canadian Beef Breeds Council to an individual who exemplifies excellence and passion in the purebred beef cattle industry. After graduating from university, Matthews joined the family in operating Highland Stock Farm, a purebred Angus and mixed farming operation. From this point, Matthew’s influence on the farm and his numerous other endeavours had a profound impact on beef cattle production in Canada. 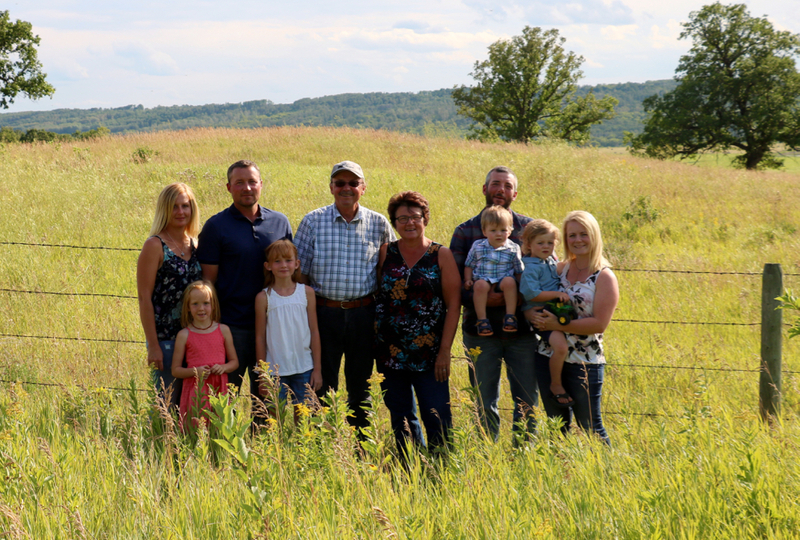 His influence at Highland Stock Farm soon took shape as it shifted from being primarily an Angus operation to expanding into a new frontier as pioneers of the Limousin breed in Canada. As early importers of Limousin cattle, Highland Stock Farms soon established their place as leaders in the breed. He was among the first to introduce polled and black genetics into the breed and was one of the first breeders to utilize embryo transfer technology. With the help of his good friend Dr. Murray Jacobson, the first Limousin embryo calf was born at Highland in 1973 and the first Angus embryo calf was born at Highland in 1975. The Canadian Beef Breeds Council is extremely proud of the accomplishments that Rob Matthews has made toward beef cattle production in Canada and is honoured to present him an award named in memory of his late father. CYL mentees have been as busy as ever! Many are spending valuable time getting to know their mentors while continuing to explore everything that the Canadian beef industry has to offer. 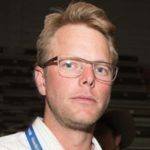 CYL graduate Wilco van Meijl was featured in the cover story of the March 2018 Canadian Cattlemen sharing his experiences at the International Beef Alliance in Paraguay. 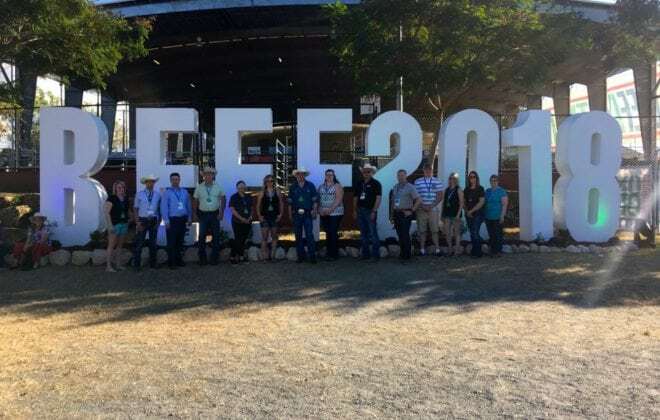 CYL grad Mona Howe and past CYL Lacey McCrae had the opportunity to take part in CYL’s first exploratory trade mission to Texas for the World Braford and Brangus Congresses. The events provided a great breadth of insight into cattle production around the world. Breeders from countries including Brazil, Paraguay, Australia, Uruguay and the United States joined both tours. CYL Carley Henniger and her mentor, Bob Lowe, had the opportunity to join the Young Cattlemen’s Council’s first ever Lobby Fly-In event in Ottawa. Carley had the opportunity to experience Parliament Hill and discuss important beef industry issues with MPs. CYL graduate Jessica Sperber was one of two Canadians selected as a scholarship recipient at the recent International Livestock Congress, in Houston, Texas. She had the opportunity to take in the congress, through the scholarship program and was recognized at a luncheon during the event. Applications for the CYL program closed on March 31 and we will soon have a look at all of the new candidates. CYL has also launched it’s official Instagram page! If you are part of the Instagram world, give CYL a follow at @Cattlemens_young_leaders! Raised on a fourth-generation family farm near Redvers Sask., Allan got started in the livestock sector through 4-H. He then started buying and showing purebred Hereford females and exhibited at several Canadian and U.S. junior nationals. 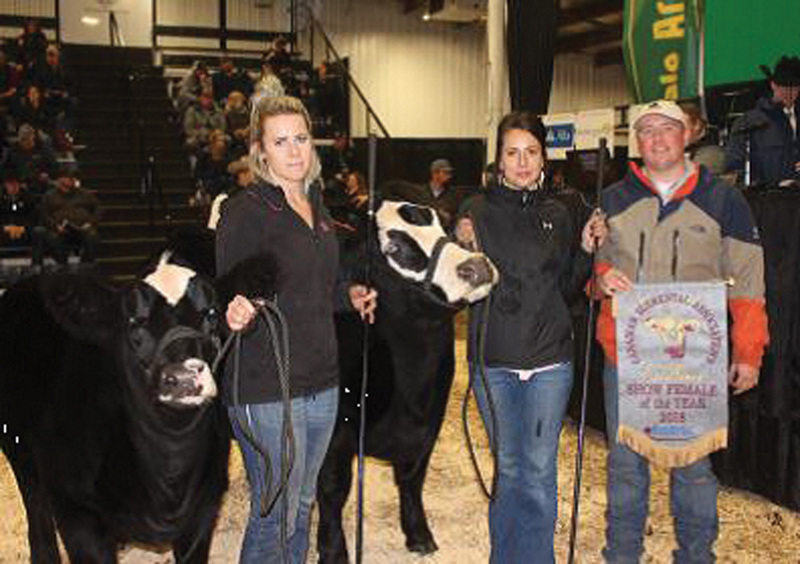 After high school Allan began doing custom work for purebred operations typically focusing on show and sale cattle. Allan has exhibited and prepared cattle at major shows across North America, Australia, and Argentina. He is currently employed with Double Bar D Farms, a large mixed farming operation in Grenfell, Sask. Cale was raised on a third-generation cattle ranch west of Grande Prairie, Alta., started in 1964 by Cale’s grandparents. The family ranch has grown to accommodate a consistent herd of 1,500 Simmental/Angus cows. 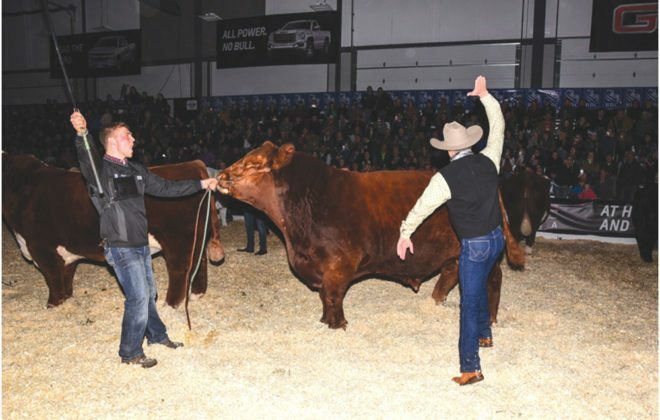 Cale was extensively involved in the local 4H beef club from the age of nine and in high school pursued the creation of his own purebred Simmental cow herd, marketing his cattle across the province. After high school graduation, Cale studied in New Zealand for six months. 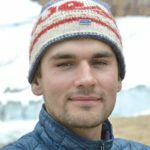 This experience led him to pursue the study of science at a community college in Grande Prairie, working on the family ranch during the summers. He is currently attending the University of Calgary with plans to attend veterinary school upon graduating with his bachelor’s degree.